Regional newspaper commentators are calling on local leaders to unite in their efforts to curb a cholera epidemic spreading through Zimbabwe, though one South African writer cautions against a potentially "disastrous" military intervention. One commentator, writing in a Zimbabwean pro-government newspaper, disputes the right of the West to pass moral judgment, citing an obsession "with a racist illegal regime change" in the country. An opposition paper says that the cholera crisis has fatally undermined the incumbent regime. The escalating humanitarian crisis in Zimbabwe needs serious attention not only from that country's politicians but from all southern African leaders. There is a need to find solutions to the problems in Zimbabwe. People in that country cannot afford to wait any longer. Namibia, like the Southern African Development Community and the African Union, did not come to the rescue when it had to. It has let the people of Zimbabwe down. Namibia must not fail again to help its neighbours in this dark hour of crisis. Tongue-lashings will do little to end the Mugabe regime's abuses of its people. The continent's leaders must pressure the despot into stepping down or accommodating the Morgan Tsvangirai-led MDC in a power-sharing deal. While the latter option is clearly an unhappy compromise, it may be the only realistic option. Deposing Mugabe will not necessarily help Zimbabweans because the [opposition] Movement for Democratic Change is not ready to govern. In such a vacuum - compounded by a foreign military presence and the absence of national cohesion - military intervention could turn disastrous. 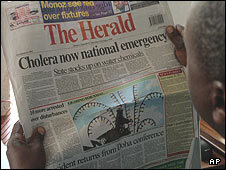 The United Nations is busy with contingency planning for the possible fourfold increase in cholera cases in Zimbabwe. This could give rise to a renewed influx of sick Zimbabweans across the border of South Africa and other neighbouring countries. Zanu-PF likes to think it is knowledgeable about everything, capable of finding solutions and therefore in total control. The cholera crisis, food and cash shortages and a collapsing health sector have shattered that notion.